Visibility/Location: With the address provided to HauntedIlinois.com and using my vehicles navigation/GPS system with the location Champaign County Fairgrounds we actually came out to Coler at a dead end at Carle Hospital. Since I had someone with me that knows where the fairgrounds are she led us to the location. I did not see any signs at first; but then at the far end of the parking lot I saw a flashing light. The lighted sign said Haunted Barn. Depending on the direction that you were coming on Coler Avenue the location would be very difficult to find because of only having one banner near the road. From the direction I was heading, the unlit banner near the road was only visible to me in my rearview mirror. The actual address to go to is 1302 N. Coler Avenue, in Urbana. A sign instructing where to park would have been helpful. Wait Entertainment: There were two concession stands to enjoy as you walked up to the event. As we approached the barn there was an evil looking hillbilly with white eyes walking towards us. We purchased our tickets and proceeded to the line. Once at the door there were two malevolent doll faced girls dressed alike and they were same size. Standing side by side their stares were downright alarming. They did not make a sound at all. 2 small zombie children were roaming around, complete with their pajamas and stuffed animals just waiting for the hayrack to come by. 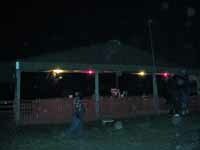 A hayrack ride that can be seen from the haunt travels around the fairgrounds. The waiting area and haunt were in a converted livestock barn. So there was a sheltered waiting area if the elements were a little undesirable. Crowd Control: I can�t honestly give an opinion on how the haunted barn would handle crowd control since we were the only group in the haunt at that time. We did move at a nice pace in order to take in the details of the haunt. Midway of Madness Haunted Barn is a good mix of pneumatics and jump out actor scares. I believe they have the age just about right with the recommendation of 12 on up. As we entered the first door, a girl, in street clothes, led us down a dark hall and helped us step onto a platform and then she shut the door behind us. I would have liked to see her in a costume just to set the haunt off and for the madness to begin. Once in the dark small room there was a nice surprise from a pneumatic prop. A door on the other side of the room slid open and a man in another dark room asked us to come in and sit. He then had us read the rules for the house. This was a dark room that had 1 small light focused right on an ornate framed list of rules. About 10 seconds of reading and the frame on the wall jumped out at us. A real nice start for what laid ahead. We stood up and walked down a dark hallway. A large slam, followed by a pneumatic werewolf flailed just inches from our faces. I really thought it was an actor at first. More dark halls followed with different props and scares, a zombie ticket taker, and then on to a concession stand. The concession stand was a little crazy. I like corndogs; but not shoved into my eyes like the prop had. The concession worker was trying to take our eyes out with a large pair of tongs. She said she had special popcorn balls to make. Each scene was separated by a dark corridor and followed by a Midway/Carnival theme room. Some more carnival games were waiting for us around every corner. They were detailed with the actual game, plus the prizes you could win. One carnival game worker decided to follow us for a little bit and taunt us to play his games and others. As he followed the group a giant boa constrictor came out of one of the games at the leader of our group. The atmosphere from this point changed a bit, more of a haunted barn theme. Walking into something that all I could describe it as a cattle chute was a little unnerving. Board slat fences and gates surrounded us. 3 masked figures made sure that we were pushed through the maze. At the end a wild mangy dog awaited. I felt like being in a human stockyard waiting for slaughter. After a couple more rooms we found ourselves in a very long hallway. Each side of the hall was covered in a row of corn and straight ahead in the air was a scarecrow. The smell of the corn was strong, walking through a cornfield is creepy by itself, yet alone being trapped in a row of corn. As we made our way down the hall about halfway the lights went off. We were once again in pitch black. The scare was unbelievably very effective. I won�t give this one away. The last corridor that you walked down was a very long one also. The end of the hall contained one dark figure waiting to greet you. The scare actually came from another direction totally unexpected. Nice effect to get patrons out of the house very quickly. The actors, a mix of children and adults, did a very nice job keeping in character for the most part. There was one point where we heard chatter about what a couple of actors had done that day. It is a barn with some parts of the ceilings being open so sound will carry. However there were some standouts. I have to give props to the twins at the front of the house, the concession lady and the scarecrow they all did outstanding jobs in their characters. Most of the Midway of Madness was black painted plywood (understandable due to the entire haunt would have to come down each season and really much better that just black visqueen material); but then decorated with detailed props and scenes for the patron to understand what they were walking into. Wood chips on the floor to make it feel unstable in the dark were an added bonus. The haunt used mostly the old school scares which I am a big fan of. I do like pneumatics too; but will choose old school scares 9 times out of 10. Midway of Madness Haunted Barn uses old school scares very well. Overall I would have to say that I was impressed with my visit to Midway of Madness Haunted Barn. I would definitely try to visit before the end of this Halloween season.